”I took another bite, then sawed at the duck, and started getting pissed off. ‘Yeah,’ Adam said. ‘This is pretty shameful. I can’t eat this.’ He pushed it away. 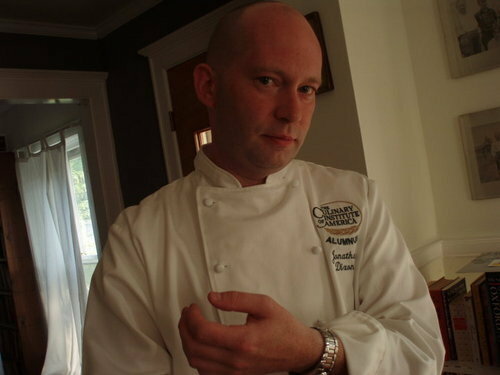 Jonathan Dixon, chef or superspy or both? I’ve read a decent amount of spy novels in my reading lifetime, so every time the author Jonathan Dixon uses the acronym CIA, my mind instantly translates that as the Central Intelligence Agency. With the recent activity of the Bush Administration, the title Beaten, Seared and Sauced might also have been applied as a normal function of the CIA. Now that I’ve finished this book, and I think of the CIA as the Culinary Institute of America, the next American spy novel I read could be a bit tricky. There are a couple of points in time, typically, when a young man or woman might feel the need to start applying themselves in a more productive direction. It could be when they are knocking on the door of thirty, or if they are particularly stubborn, it might take until they are approaching forty. Usually, these realizations come when they finally give up the last vestiges of their childhood and find that scraping by, while trying to figure out what they are supposed to do with the rest of their lives, is starting to be embarrassing rather than charming. No rest for the wickedly OLD. I would think that the first qualification for a student at CIA would be that they love food, but Dixon runs into students who don’t seem to like food at all. One eighteen year old guy will only eat hamburgers for every meal. ”’Do you want to try some of this?’ I pushed a plate at him that had foie gras mousse piped into profiteroles. It had been up for grabs on the buffet table when you walked in the cafeteria door. I was ecstatic when I figured out what it was…. ‘Really? How often are you gonna get this? Try it.’ I suddenly felt like my mother. Raising my kids, who are certainly not food explorers, and having to deal with their friends having even more reduced palates than my own kids, I’ve reached a point in my life where I refuse to dine with people under 30 unless they can answer a few questions first. Brussel sprouts ( Okay, I only use that one if they have already annoyed me.) If they haven’t annoyed me, I’ll ask if they eat green vegetables. Life is too short to dine with people who truly are incapable of enjoying food. So if the only food you personally desire is a hamburger, why would you want to be a chef? Simply baffling! Jonathan Dixon frequently consults his Zuni Cafe Cookbook, which brings back some fond memories for me. When I lived in San Francisco and worked for Green Apple Books, my boss had a standing reservation at the Zuni Cafe. I was fortunate to be invited to dine there several times. This was the only time in my life where I’ve walked by this long line of people outside a restaurant waiting to eat and been whisked immediately to our table with vodka martinis miraculously appearing simultaneously with our arrival. I like the fact that the teachers at the CIA are so intent on nothing being wasted. This is to help future employers of these students, because waste is lost revenue. Also, this philosophy reflects a respect for nature, whether it is an animal or a plant that gives up its life to become food. The teachers are not created equal, of course, and each one has his own style which is a reflection of his personality. One teacher in particular achieves that allusive combination of being tough and, yet, inspirational. The best way to learn anything is through repetition, but given the scope of what needs to be covered in the short amount of time with each course, repetition is impossible. For instance, deboning a roast...Dixon butchers his poor roast in the one time he is allowed to try. It is not pretty. An instructor shows him how to perfectly cube his potatoes, which is harder than it sounds. It involves standing at the right angle and holding your knife at the right angle. Dixon can’t go out and buy a bunch of roasts to practice deboning, but he can buy a 50 pound bag of potatoes and practice his cubing...outside of class. I do have to applaud Jonathan for making the decision to go back to school and start a new career at 38. It is not easy. Money is a looming concern that adds stress to an already stressful school schedule. He makes some extra money freelance writing. At one point he takes a semester off from school to accept a writing project that will keep him afloat for a while longer. He does what he needs to do to keep his dream of graduating alive. I picked up this book remembering fondly reading Anthony Bourdain’s Kitchen Confidential, and nobody tells cooking stories like Bourdain, but the truthfulness and the accessibility of Dixon’s strife and ultimate triumph are...inspirational.